in the quiet dance/duet sleep Â©Sarah Rimkus, 2011. All rights reserved. Program notes In the midst of my junior year, I found myself at a strange juncture. 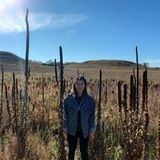 Somewhere between “college kid” and “adult,” I was struggling to strike a balance between all the aspects of being a student while trying to build the foundation for a successful career as a musician. While many other things seemed to be going so well, I kept struggling to write instrumental music. Try and try again, nothing seemed to be working. I began to wonder if I really was true composer of concert music. Eventually, I did what I do when I don’t know what else to do – I started banging on a piano. Piano is my first instrument, and while piano performance decidedly did not work out, piano improvisation is still one of the most satisfying musical pursuits for me. 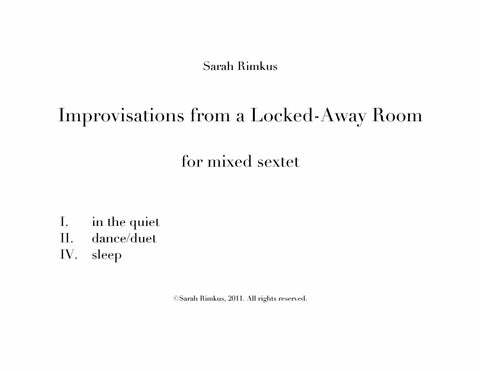 So, I decided to base this piece on my own improvisations, edited and scored out for ensemble. However, something funny happened as I continued writing – improvisation turned into composition. But I wasn’t overthinking it or agonizing over it. It was like I was improvising, but on paper instead of at the piano. Finally I had found a compositional process that truly works for me. For the first time, I could say with confidence that I am indeed a composer after all. I have titled the piece “Improvisations from a Locked-Away Room” because this was also the first time in my life that I truly felt that I have to fight for my time to myself. Therefore, this piece is, in a sense, a meditation on different perspectives on solitude. I have learned beyond a shadow of a doubt that solitude is crucial for me to come up with my best ideas. - -- B 44 œ . œJ œ œ "
44 ‰ j #œ ˙. œ œ B 44 œJ # œJ œ œ œ w # ? 44 ! ©Sarah Rimkus, 2011. All Rights Reserved. F Ó ‰% r 34 ˙ . # œ 44 # œ ˙. 43 œ œ œ œ œ 44 3 4 ˙. ‰ j bœ bœ bœ ! # ˙˙ ˙˙ œœ p ! ˙˙ ## ˙˙ œœ # ˙˙ . # ˙˙ . ˙ b˙ œ ˙. #˙ ˙ ˙ œ ˙. 2 5 4 Œ Œ 4 ˙ ˙ œ b˙ ˙ œ ˙. % # œJ œ œ œ œ œJ ˙ . Œ Œ ‰ œj 44 ˙ ƒ ! œ œ # œJ œ œJ œ œ œ œ # œ ˙ . P sub. ff ! - - - >œ œ bœ œ œ J œ. & ƒ ? b œ œ- œ- œ- >œJ œ . #˙. 45 45 ˙ . œ œ œ œ œJ ˙ . j #œ #œ œ 3 #œ œ #œ Nœ 4 ˙. œ # œ # œ # œ œ œ # œ 43 ˙ . ! 45 ˙ . ˙. 45 5 4 ˙. j œ œ œ #œ œ œ. & 43 # ˙ . 4 ‰ œ œ œ #œ œ œ ˙ 4 J f 44 ! œ œ œ œ œ œ œ bœ œ œ ˙. p ! j # œ . ˙. #œ œ œ #œ œ ˙ œ œ œ œ œ P ! j > #œ . ˙ ## œœ .. ˙˙ 3 4 ˙. ‰bœ œ œ œ # œ . f ! 45 Ó P 5 4 ˙. œO œO œO œO œO œO œO œO Ȯ > > > ˙. # œœ œœ œœ œœ œœ œœ œœ œœ b œœ œœ œœ œœ œœ œœ œœ œœ œ.
œ bœ œ œ œ bœ œ œ œ œ œœ œœ œœ œ œ œ nœ œ # œ œ œ œ œ œœ œœ œœ œ œ #œ #œ ! & ?‰ j & œ. & œ #œ œ œ œ œ œ F Ÿ 46 œ. ˙ & P œ œ œ œ œ œ œ ? #œ & # œJ P ? j œ œ Ÿ œ.
œ œ œ œ œ ! Ó œ # œ # œ œ œ n œ œ œ œj œ œ b œ œ œ œj œ œ b œ œ œ œ . œ > >>> with intensity œ#œ#œ œ nœ œ œ # œ # œ œ œ >œ > > >œ œ œ œ œ œ œ œ œ œ œ œ œ œ œ œ œ # œ œ œ œ œ œ œ œ œœœœœœœœ sub.pp ! ! ! ! # œœ œœ œœ œœ œœ œœ œœ œœ ! ! ! & # œ œ œ œ œ œ œ œ # œ œ œ œ œ œ œ œ œ œ œ œ œj‰ ‰ . œ œ œ œ œ œ œ # #œ œ œ œ œ œ œ œ #œ œ œ œ œ œ œ œ #œ œ œ œ œ œ œ œ ! & #œ œ œ œ œ œ œ œ #œ œ œ œ œ œ œ œ # œœ œœ œœ œœ œœ œœ œœ œœ # œ œ œ œ œ œ œ œ œœ œœ œœ œœ œœ œœ œœ œœ ? ! #œ œ # œœ œœ œœ œœ œœ œœ œœ œœ # œœ œœ œœ œœ # œœ œœ œœ œœ ## œœœœ œœœœ # œœ œœ œœ œœ œœ œœ œœ œœ # œœ œœ œœ œœ œœ œœ œœ œœ ‰ œ œ ! ! ! œœ œœ œœ œœ œœ œœ ˙ ˙ ! & œ œ œ œ œ œ œ œ œ œ œ œ œ œ œ œ œ œ œ œ œ œ œ œ œ œ œ œ œ œ œ œ #œ œ œ œ œ œ œ œ #œ œ œ œ œ œ œ œ #œ œ œ œ œ œ œ œ #œ œ œ œ œ œ œ œ #œ œ œ œ œ œ œ œ # œ œ œ œ œ œ œ œ ? œœ œœ œœ œœ œœ œœ œœ œœ œœ œœ œœ œœ œœ œœ œœ œœ N œœ œœ œœ œœ œœ œœ œœ œœ œœ œœ œœ œœ œœ œœ œœ œœ N œœ œœ œœ œœ œœ œœ œœ œœ œœ B J f ? œ #œ #œ œ œ œ œ ! b œ- ˙ bœ J f ! bœ œ œ œ œ œ œ œ bœ œ œ œ œ œ œ œ bœ œ œ œ œ œ œ œ œ œ œ œ œ œ œ œ !
? œ œ œ œ œ œ œ œ œ œ œ œ œ œ œ œ œ œ œ œ œ œ œ œ b œœ œœ œœ œœ œœ œœ œœ œœ œœ œœ œœ œœ œœ œœ œœ œœ bœ œ œ œ œ œ œ œ bœ œ œ œ œ œ œ œ bœ œ œ œ œ œ œ œ 80 b œ- ˙ bœ. ˙ œ. œœ. J Ó Ó B bœ & Œ. bœ ? œ bœ œ œ œ bœ œ œ œ œ œ œ œ œ œ œ œ œ œ œ œ œ œ œ œ œ N œ œ œ œ œ œ œ œ Nœ œ œ œ œ œ œ œ ! # # œr œ . ˙ ˙ # ˙˙ ! !
" b œ. b œ.
p œ j ˙ œ œ‰ . œ. b œ. Œ Œ "
# ˙˙ .. # ˙- . 12 # œœ .. 16 œ .
œœ j bœ b œ. ?4 4 œ. œ >. œœ n œœ œ nœ ! ƒ œ œ œ œ œ œ œ œ ? #œ œ œ œ #œ œ œ œ œ œ œ œ œ œ #œ & ! & ! N N œœ ! œœ ! œœ œœ œ œ œ œ ?
! œ ! œr ! !
! Nœ ! œ ‰ ! r #œ ! œ ! œ ! ! #œ ! œ ! ‰ ! N N œœ ! œœ œœ œœ ! r ‰ œ œ "
" ‰ j œ ˙ ! " ‰ # # Oœ Ȯ J ! ‰ œ œ b œ. b œ- . 44 "
38 b b œOj ‰ ‰ < 38 Oœ ..
68 œ . # œ . 12 ‰ 38 #œ œ œ 8 ˙. #œ. #œ > # œ . # œ ‰ 3 # œ œ >œ 12 ˙ . 8 8 œ. #œ. 85 # œ .
œ # œœ #œ # œ " "
Oœ O #œ J P Œ.
œœ .. œ. œœ . .
#œ. œ œ œ #œ œ œ #œ œ #œ œ # œ œ œ 3 ‰ J 4 f #œ. œ œ œ #œ œ œ #œ œ #œ œ 34 œ #œ ‰ # œJ f "
#œ. œ œ œ #œ œ œ #œ œ #œ œ # œ œ #œ 3 ‰ J 4 f ˙. b www 34 ˙˙ .. # # ww # # ˙˙ .. "
B 85 # œ . # # œœ .. ! œ. œ. .j œ # # œœœ ‰ ‰ # œœœ œœ œ J.
j ‰ ‰ Œ. # œ. " "
‰ # œJ œ . " Perusal score of "Improvisations..." for viola, cello, clarinet, bassoon, horn and piano. Not licensed for parts or performance.